Oregon QB Marcus Mariota, the “Flyin’ Hawaiian,” has officially declared for the 2015 NFL Draft. This comes as no surprise, as Mariota is expected to be a Top-5 pick, with many believing he could go No. 1. Mariota leaves Oregon having completed his degree in General Sciences, with a focus on Sports Medicine. His performance in the National Championship Game made him the first player in Pac-12 history to accrue more than 5,000 total yards in a single season, along with his various other records. Mariota was also the first player in University of Oregon history to win the Heisman Trophy, awarded to the best player in college football. Mariota leaves behind at Oregon a historical collection of records, unprecedented bowl victories, and above all, he leaves with having accomplished his highest personal goal — being the consummate teammate. 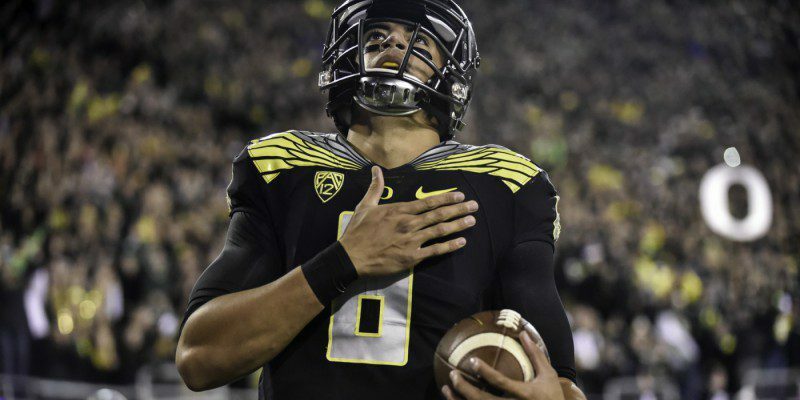 Mariota’s legacy will go down in Oregon history as one of, if not the, greatest Duck of all time.